A favorite neocon meme about President Barack Obama is that he is "weak" -- because he failed to bomb Syria, bomb Iran, sustain the U.S. occupation of Iraq and start a full-scale economic war with Russia over Ukraine. But an alternate way of looking at Obama is that he is weak because he has failed to face down the neocons. Since the start of his presidency, Obama has let the neocons and their "liberal interventionist" allies push him into militaristic and confrontational policies -- even as he is criticized for not being militaristic and confrontational enough. There was the futile "surge" in Afghanistan, the chaotic "regime change" in Libya, excessive hostility toward Iran, intemperate demands for "regime change" in Syria, and hyperbolic denunciations of Russia for its reaction to U.S.-backed "regime change" in Ukraine. The end result of all this U.S. "tough-guy/gal-ism" has been to get a lot of people killed without actually improving the lot of the people in the countries where the neocon-driven policies have been applied. In each of those cases, a more pragmatic approach to the political and strategic concerns represented by those crises could have saved lives and averted economic pain that only has fed more disorder. In the essay, "Superpowers Don't Get to Retire," Kagan "depicted President Obama as presiding over an inward turn by the United States that threatened the global order and broke with more than 70 years of American presidents and precedence," wrote the Times' Jason Horowitz. "He called for Mr. Obama to resist a popular pull toward making the United States a nation without larger responsibilities, and to reassume the more muscular approach to the world out of vogue in Washington since the war in Iraq drained the country of its appetite for intervention." As part of Obama's effort to deflect this neocon critique, "the president even invited Mr. Kagan to lunch to compare world views," Horowitz reported. Kagan apparently sees himself as a vanguard for a new wave of U.S. interventionism, teamed up with his brother Frederick who devised the two "surges" in Iraq in 2007 and Afghanistan in 2009. 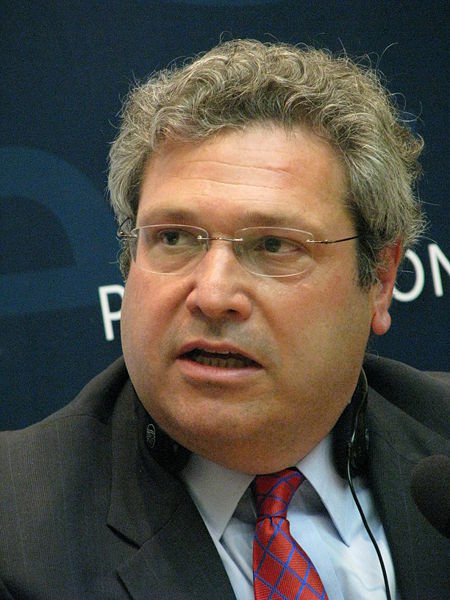 Robert Kagan is also married to Victoria Nuland, the assistant secretary of state for European affairs who helped promote the February "regime change" in Ukraine. According to the Times article, the husband-and-wife team share both a common world view and professional ambitions, Nuland editing Kagan's articles and Kagan "not permitted to use any official information he overhears or picks up around the house" -- a suggestion that Kagan's thinking at least may be informed by foreign policy secrets passed on by his wife. Though Nuland wouldn't comment specifically on Kagan's attack on President Obama, she indicated that she holds similar views. "But suffice to say," Nuland said, "that nothing goes out of the house that I don't think is worthy of his talents. Let's put it that way." Kagan also has hopes that his neocon views -- which he prefers to call "liberal interventionist" -- will have an even stronger standing in a possible Hillary Clinton administration. After all, not only did Secretary of State Clinton promote his wife, Clinton also named Kagan to one of her State Department advisory boards. According to the Times' article, Clinton "remains the vessel into which many interventionists are pouring their hopes." Kagan is quoted as saying: "I feel comfortable with her on foreign policy. ... If she pursues a policy which we think she will pursue ... it's something that might have been called neocon, but clearly her supporters are not going to call it that; they are going to call it something else." Though Obama personally advocates a more multilateral approach to foreign policy -- including "leading from behind" as one aide famously explained -- the President allowed the neocons to retain great influence inside his own administration. After winning the election in 2008, he opted for a "team of rivals" approach that put the hawkish Hillary Clinton at State, retained Republican Defense Secretary Robert Gates and kept George W. Bush's high command, including neocon-favorite Gen. David Petraeus. That fateful decision meant Obama never asserted personal control over his foreign policy, in part, because Gates, Petraeus and Clinton formed a kind of iron triangle to promote neocon strategies. In his memoir Duty, Gates said he and Clinton agreed on most issues and could push them in the face of White House opposition because "we were both seen as 'un-fireable.'"